Road transport news in Scotland and the north of England this month features Fun in the Sun with a 12 page pictorial souvenir of Truckfest Scotland which attracted over 1,000 trucks for the first time. 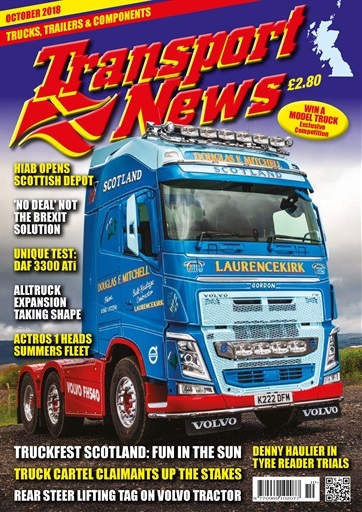 There’s a couple of interesting road tests: a Volvo tractor unit with a steering tag axle and a bit of nostalgia as we put a refurbished DAF SpaceCab 3300 ATi through its paces. We acknowledge the 40th anniversary of Iveco’s Daily van and Alltruck takes on the Fassi crane dealership for Scotland.